We are a leading nursing and social care recruiter with a comprehensive range of health care jobs and social care jobs. 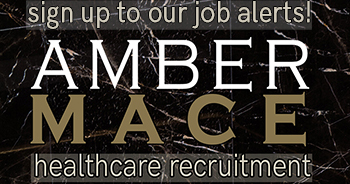 Specialising in health and social care vacancies, Amber Mace are able to offer job seekers their perfect career. Your time is important and we respect that. Our approach to recruitment is “less is more”. There are only a very few jobs out there that are the perfect fit for you and these are the ones that we find and these are the only ones that we send you to. We don’t employ pushy sales people and we never approach a company on your behalf until we have your permission to do so. Our approach is about genuine consultancy and focuses on building long-term engagements between candidates and clients. We will focus our time and energy on finding you the ideal job and our consultants will only send you to interviews after they ensure you are fully prepared and stand the best chance of success. We streamline your experience perfectly – no need to register, just email your CV to our consultant specialising in your area when you find a job you are interested in. Please see above for all our current vacancies. See our Privacy Notice here. Keep your CV to no more than two pages. The aim of the CV is to get an interview, not to tell your life story. Employers spend, on average, just 8 seconds looking at any one CV. To keep their interest, you must be clear and concise. Create a unique CV for every job you apply for. Take the time to research the company and use the job specification to work out exactly what skills you should point out to them in your CV. Buzzwords make your CV meaningless – employers see the same words used over and over again. Swap them for plain, factual statements to show you’re right for the job. This is one of the most effective ways to attract an employer’s attention. Use metrics or results for at least 40% of the bullet points on your CV. Employers love to see numbers – they add credibility to your accomplishments. You need to account for recent gaps in employment. Employers will be suspicious if you conceal a gap. Instead show how you used the time constructively. Mention volunteering, training courses or creating your own project.